We are so excited for the updated RRH Website, online now at www.hbot4u.com. However, please note, it is still under construction and evolving everyday! We hope to have it complete in the next couple of weeks. 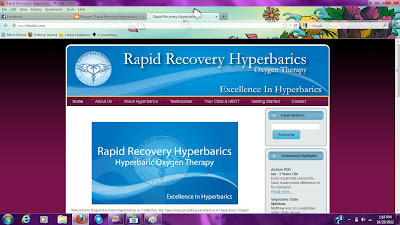 You may explore the new site or, for a more complete experience, you may also visit our previous site which is still available at www.rapidrecoveryhyperbarics.com. Remember, we are also available on Facebook, Twitter, Blogger and more! We want to provide you with the best, informative, user-friendly website as possible when you research HBOT for your family, so we are very excited to have this project underway! Thank you again for your patients.